With just a few games remaining in the regular season, the NBA’s contenders and pretenders alike are preparing themselves for the first round of the playoffs. Here are Sean’s picks for round one of the NBA Playoffs. While the Charlotte Hornets or Miami Heat could take the No. 8 seed from the Pistons, Detroit has a one-game advantage in the standings and has just the Knicks and Grizzlies left on the schedule. Unless they really screw up and Miami or Charlotte wins out, they should hold on to their playoff spot and the right to get swept by the Bucks. This is going to be the most lopsided matchup this year. The Bucks are just too good to lose anyone outside of the league’s best. They have the league’s best record (60-21), the league’s best defensive rating (104.8) and perhaps the league’s best player this season in Giannis Antetokounmpo. I got the Bucks in four here. The Magic have been a pleasant surprise this season and are coming into the playoffs on a bit of a run. They’ve won 10 of their last 12, including wins against the 76ers, Pacers and Celtics. One of those losses, though, was to the Raptors. The Raptors have been phenomenal with their new superstar Kawhi Leonard and first-year coach Nick Nurse. Even when Leonard doesn’t have a big night, the likes of Kyle Lowry, Pascal Siakam, Serge Ibaka or any of their great bench players can pick up the slack. This team is too good and too deep to go down to the Magic, though I can see the underdogs steal one at home. My pick is Raptors in five. This series has the potential to be interesting. We get to see the young, exciting and overachieving Nets against the first starting lineup to ever have all five players average 17 points per game. To say that the 76ers are top-heavy is an understatement. They boast the best all-around starting five in the league outside of the Warriors with Ben Simmons, JJ Redick, Jimmy Butler, Tobias Harris and Joel Embiid. We are finally going to see what these five can do when they play with playoff intensity, which I think will blow the Nets out of the water. The Nets have been a nice story this season, but the 76ers are just too talented. I think they are going to come out with something to prove, so I have the 76ers in four games. The Pacers have gone 16-19 since their star Victor Oladipo went down with a season-ending injury towards the end of January. They were 32-15 before his injury, but despite the sub .500 record throughout the last two months, they only fell from No. 3 to No. 5 in the East. Indiana has had stretches where Bojan Bogdanovic has looked like a fine replacement for Oladipo, with Domantas Sabonis and Myles Turner dominating the paint. Though the Celtics have had more chemistry problems than any other team in the league, they have too much talent and are too well coached to lose to this depleted Pacers team. If Oladipo was healthy, it’d be a different story. But he isn’t, and the Celtics surely aren’t worried about the likes of Bogdanovic. I’m picking the Celtics in six. The Spurs could drop to the No. 8 spot if they lose their final game of the season at home to the Mavericks and the Clippers beat the Jazz, but that’s unlikely, especially when the punishment would be to play Golden State. The Warriors are 16-2 in the first round since 2015 with two sweeps and nobody taking them further than five games. 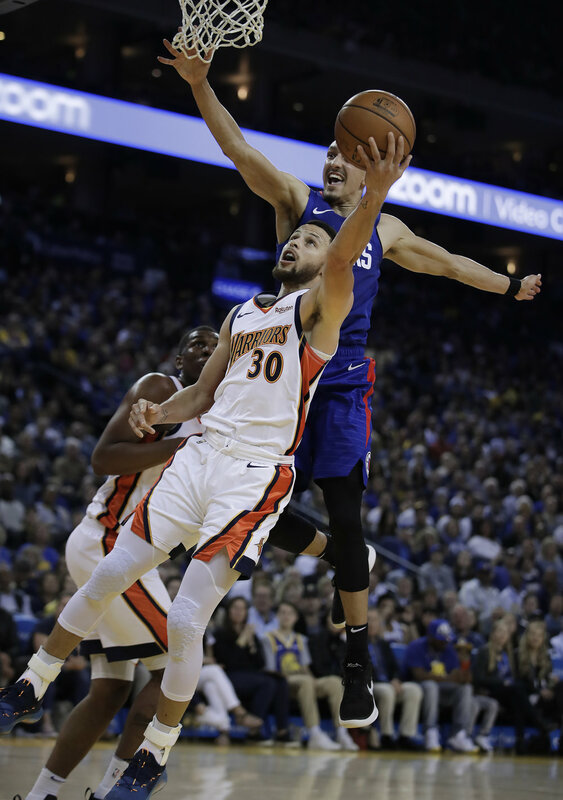 I’ve been very impressed with the new, superstar-less LA Clippers, and I think they can win a game if the Warriors have an off shooting night. That’s a pretty big if, but I’ll give them a game. Warriors in five. The Spurs may have replaced Leonard with DeMar DeRozan, but Leonard’s defensive impact is missed in San Antonio. The Spurs have the worst defensive rating (110.7) of all playoff teams. The Nuggets have one of the coolest offenses to watch in action with point-center Nikola Jokic running the show. Jokic is ninth in the NBA in assists (7.4) and is the only center in the top 35. Jamal Murray has emerged as a great second option with his combination of quickness and sharpshooting ability. Pin the Nuggets great offense against the Spurs bad defense, and this series could be ugly. I have the Nuggets in four. The Thunder have been incredibly streaky this season. Immediately following a stretch where they went 11-1, they’ve gone 10-14 since. Much of that can be attributed to Paul George’s injured shoulder. He’s been trying to play through it but also takes a day off every now and then. The Thunder have won their last three games with George scoring 30 in one win and Russell Westbrook having a 20-20-20 game in another. They have a little bit of momentum heading into the playoffs, and perhaps they have their groove back. The Rockets, on the other hand, are completely healthy going in to the playoffs. All that really matters, though, is James Harden. He’s been labeled as the guy who can’t get it done in the playoffs, so look for him to carry his absurd offensive season into the playoffs to prove naysayers wrong. Rockets in six. The Trail Blazers losing Jusuf Nurkic for the season really hurts, especially with a matchup with one of the best centers in the league on the horizon. Nurkic’s replacement, Enes Kanter, is a solid rebounder with good touch around the rim, but plays defense like his sneakers are made of lead. Regardless, Portland is blazing hot right now, going 12-3 in their last 15. Mirroring last season, the Jazz started slow, but as Donovan Mitchell has improved, so has the team. Coincidentally, they also find themselves 12-3 in their last 15. These two teams are pretty equally matched, but I’m going to give the edge to the team with home-court and big-game performer Damian Lillard. Trail Blazers in seven.